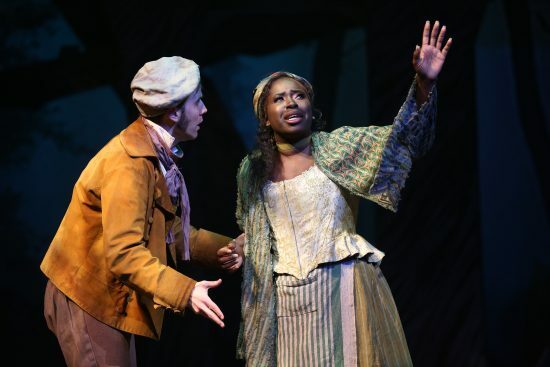 Evan Casey and Awa Sal Secka star as the Baker and the Baker’s Wife in Into the Woods, running through May 22, 2019, at Ford’s Theatre in Washington, D.C.
“Into the Woods” is a clever musical. In fact, until Hamilton came along a few years ago, some might argue that the Stephan Sondheim-James Lapine brainchild was the most clever of musicals, with its deadpan jokes, shrewd lyrics, and musical prowess. As “Into the Woods” neared and then surpassed the 30th anniversary of its original 1987 Broadway production, intrepid directors have tried to change things up a bit, as they tend to do when stories feel over-told. Here’s the thing, though—when the production is well-done, a traditional telling of “Into the Woods” is nothing short of majestic. 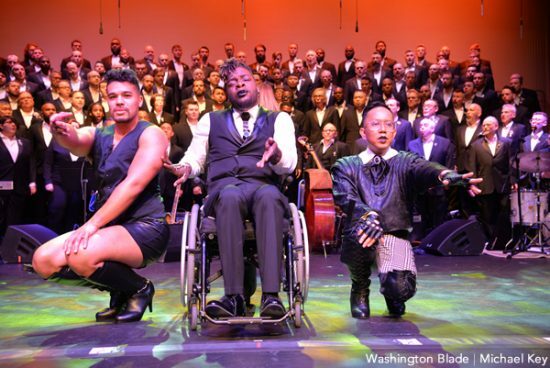 That, for the most part, is exactly what Ford’s Theatre has presented with its current iteration of “Into the Woods” (directed by Peter Flynn, music directed by William Yanesh, and choreographed by Michael Bobbitt), running through May 22, 2019, at the historic downtown D.C. theater. The success of both the script and the score of “Into the Woods” relies on immaculate timing from the cast, the crew, and the musicians, from the quick patter of the lyrics to the definitive beats of the music to the landing of any number of often-nuanced punchlines. If a musician is a millisecond off from matching the tempo of the actor (or vice-versa), the whole thing feels off-kilter. If a cast member moves on from a joke a beat too early, the audience doesn’t quite have the time to get it—and the line becomes a throwaway. The script and score might be in its early 30s, but a performance as good as this one is timeless. At Ford’s, the group pulled off the quick rhythm of the lyrics, as well as the synchronization of cast movements and music. Unfortunately, there were one too many times that the comedic timing was only slightly off, and a cast member didn’t let a subtle joke land appropriately. This was most noticeable in some of Little Red Riding Hood’s (Jade Jones) best deadpan’s (“You can talk to birds?”), as well as lines from Jack’s Mother (Rayanne Gonzales) (“You’ve stolen too much!”) It’s a long show and must be kept flowing, for sure, but a few extra seconds after some of musical theatre’s top witticisms shouldn’t be neglected. But that’s not to say that either of those two cast members isn’t phenomenal in this production—they are. In fact, it’s difficult to point out a standout performer in the cast, only because every single one of them is so darn good. If pressed, let’s first name the true leads of the ensemble cast, Evan Casey (Baker) and Awa Sal Secka (Baker’s Wife), who not only have the chemistry of a married couple when together but individually surpass expectations both vocally and as actors. The Witch (Rachel Zampelli) exhibited the perfect amount of “why-am-I-cursed-to-live-next-to-such-dumb-people” (that’s a character trait, promise), though a bit more vocal power during her second act solos—”Witch’s Lament,” “Last Midnight”—would have felt right. And let’s not forget Cinderella (Erin Driscoll), who is pure delight, and her prince (Christopher Mueller), who plays that over-the-top charmer with pinpoint perfection. Over the course of the 2-hour, 40-minute production, there were a couple of conceptual decisions that were a bit puzzling. In Act I’s “Hello, Little Girl,” the Wolf appeared on stilts, likely to make him look more menacing—which it did; however, the “CLOMP, CLOMP, CLOMP” as the actor attempted to move and dance, even just a little, made the number clunky rather than seductive. Additionally, while the Narrator and Mysterious Man are nearly always played by the same actor (in this case, Scott Seder), it was confusing that during the Act I finale, the Mysterious Man launched into the role of the narrator to wrap things up. While it’s never been a secret that the actor plays dual roles, they are still two separate characters. “Into the Woods” plays at Ford’s Theatre for another two months, but don’t wait until the end of the run to see this production. The script and score might be in its early 30s, but a performance as good as this one is timeless. “Into the Woods” runs through May 22, 2019, at Ford’s Theatre. For ticket’s and more information, visit the theatre’s website.